A dainty way to wear your initials, the Monogrammed Enamel Bamboo Bracelet is the perfect personalized addition to any stack. 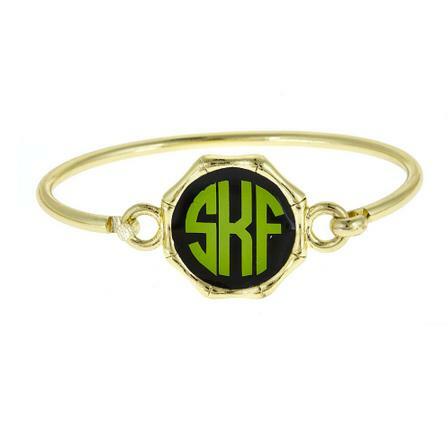 This monogrammed bracelet is gold in color with your choice of colored enameled background and your choice of colored letters. You can have 3 , 2 or 1 letter to personalize your bracelet with the same font as shown in the picture. The bamboo disc encircles your monogram and is 1 inch in diameter, has a latch closure and fits most wrists. This the the perfect monogrammed bracelet that you can stack with our great nautical bracelets and watch. Price: $45.00 In stock! - Browse this brand: FornashOur products are custom made to your specifications. This product ships up to 2 weeks after your order is placed.